Themes to match any theme, you have in winterboard! 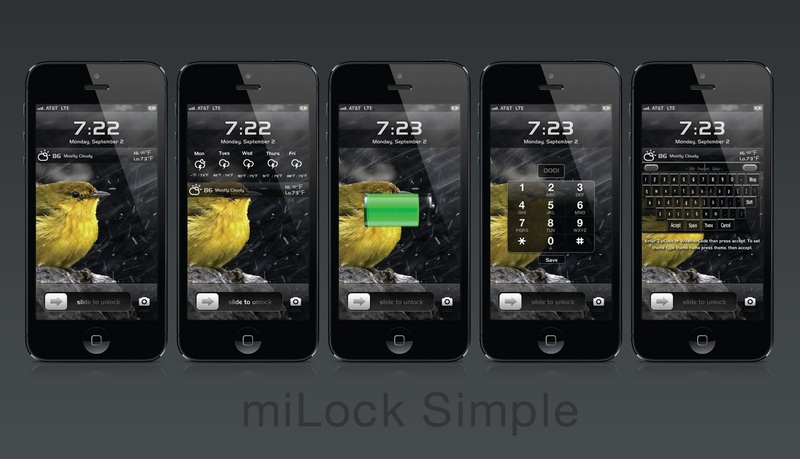 miLock Simple uses swipe gestures and touch functions to move around the lockscreen. Keyboard: When keyboard is shown you can set weather by typing in your zip code or weather code, then press Accept. THEMES! while the keyboard is up. If you type in the name of a theme. That you have in winter board, press theme, then press accept. The lockscreen will theme to match that Theme! Note: Theme name must be exactly as show in winter board. If still doesn't work try adding .theme to the name. Another great lockscreen, pushing what even I thought was possible. The way the matching of any theme works is. The lockscreen takes the name you enter, saves it to a cookie. It only saves to a certain cookie if the button Theme is pressed before accept. Otherwise if only accept is pressed it saves your zip code to a cookie. In another part of the LS it uses the cookie and searches to Library/Themes/YourEntered(cookie)/Theme/Bundles/ when it gets to bundles it checks to see if a few images exist in this theme. com.apple.TelephonyUI for BarLCD@2x~iphone and keypad@2x~iphone. If the theme has these images, the lockscreen will use them. If not it will use stock images. Continuing I will talk about how the wallpaper system works. Each image you have in your CameraRoll, gets a number. This number starts at 0000. The first image you save to your phone is 0001. If you long press on the wallpaper in miLock Simple it will bring up a keypad. You enter say 0001. It will then do as it did above with the theme images. It will look in your camera roll and see if 0001 exists. Once it finds it, it will then check to see if .png or .jpg. If it is, it will then set that image url to a cookie. if you come to a .mov or an image that has been deleted, the wallpaper will just be black. Once to a cookie, it is used two different ways. First it is applied to the Wallpaper. This is done by exchanging the img src of the div with the image from the cookie. Then it uses this cookie for the swipe function. If you swipe left it will go up in images. if you swipe right it will go down in numbers. Meaning the 0001 you put in will go to 0002 or 0001 if swiped the opposite way. Every swipe it saves over this cookie and changes the wallpaper. which stays even when the user unlocks the phone. Then opens the lockscreen. Or resprings/powers off.